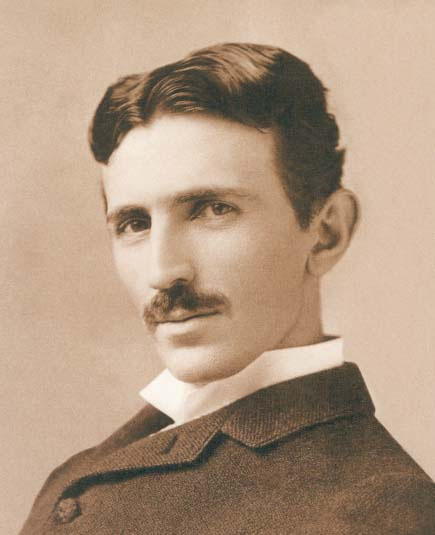 The US Patent Office, after a long battle, took the credit for the invention of radio transmission away from Marconi, issuing it to this man Tesla. You probably have never heard of him. He would finish a day's work in the laboratory, and privately search for God. "It seems," Nikola said, "I have always been ahead of my time." "If we were," remarked B A Behrend, distinguished author and engineer," to eliminate the results of Mr Tesla's work, the wheels of industry would cease to turn, our electric cars and trains would stop, our towns would be dark, our mills would be idle." Nikola Tesla was born in Serbo-Croatia around Belgrade in 1856. His father was a Christian Pastor, and knew the Bible almost by heart. His mother was innovative with kitchen and household equipment. They sent Nikola to get a scientific education at the polytechnic University in Gratz. He then immigrated to America to attend the Univ of Chicago to study the nature of relativity, and to work on his electrical and energy transmission patents. Tesla won a Nobel prize in physics in 1912. He died in 1943. He was one of the most creative inventors that ever lived. His knowledge of quantum physics and energy should have been put to use – then there would not be all the high-tension wires running everywhere causing disruption and wrecking nature’s scenery!! towers 100 yards apart. Not bad eh ? body and the immune system. vortex motion of the particles in the plasma. shoot down enemy aircraft and missiles. remote brain changing and mind control.